At the gym, there is the Stairmaster and then there is the Stairmaster Gauntlet. If you've not seen these two torture devices, the former has levers that go up and down to simulate climbing stairs while the latter is basically a 'treadmill' of stairs that rotate around underneath you on a belt so that you must truly climb stairs. If I have my choice though, I prefer to do such workouts at the local football stadium. 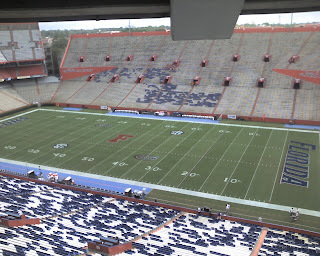 In Gainesville, Ben Hill Griffin stadium at Florida Field (links to Wikipedia and the UF Athletic Association) has ninety rows of bleachers in the East stands, which are the student sections. This picture gives you a little of an idea what it looks like from the West stands looking East when the stadium is empty. 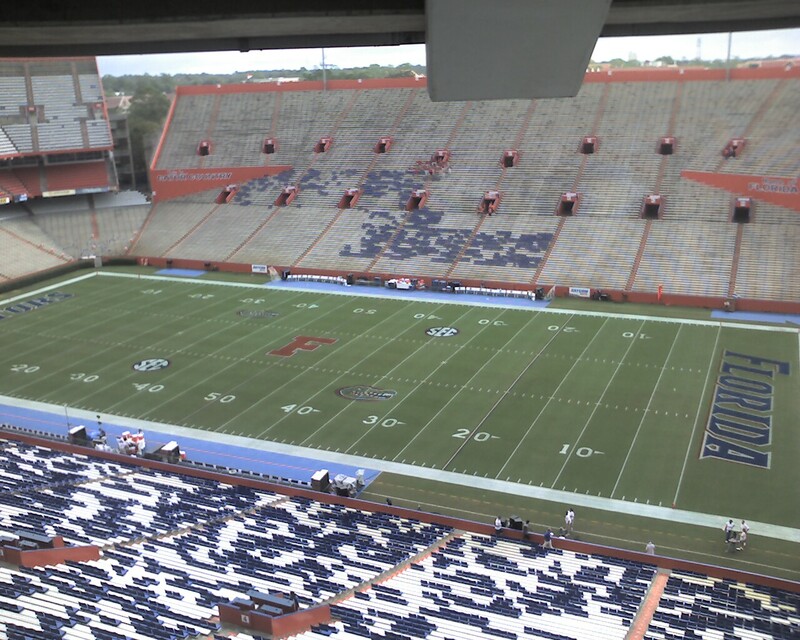 The UF Athletic Association allows the public to access the stands (not the field) through most of the day. They open it around 7AM, so I cannot workout there before work, but the afternoons are great. "Running stadiums" is quite a popular workout for college students and locals, and there are several ways you can do them. The lower 30 rows are a little deeper and less steep. You can probably appreciate from the picture that the upper 60 rows are much more steep. Some restrict themselves to just the lower 30 or upper 60. Some run up and down the stairs, personally, I prefer to go up and down all 90 rows speed-walking the bleachers themselves. You can run them if you choose, but be prepared to be exhausted after just a few runs. If you walk them, you can expect to have jelly legs within about 10 cycles. I cannot seem to find any stats about the stairs or the height of the stadium online, so the next best estimate I have is from my Garmin. Those with Garmin devices know that they are imprecise, but the estimate I get is that the rise from the bottom of the East stands is somewhere around 130 feet up divided by 190 feet across, therefore a percent grade of 68% (somewhere around 30 degrees slope).